When an established engineering technology turns into cover story material for the mainstream media as “something new” it means that the technology may be ready to explore new markets. 3D Printing is one such technology. USA Today has 3D Printing as its cover story today. Here is a picture of the print article. The picture in the article shows Rajeev Kulkarni, VP and General Manager of the Consumer Solutions Division at 3D Systems (who happens to be my boss) pretending to work at his desk. 😉 And yes, his desk does look like that. You can read the full story here. 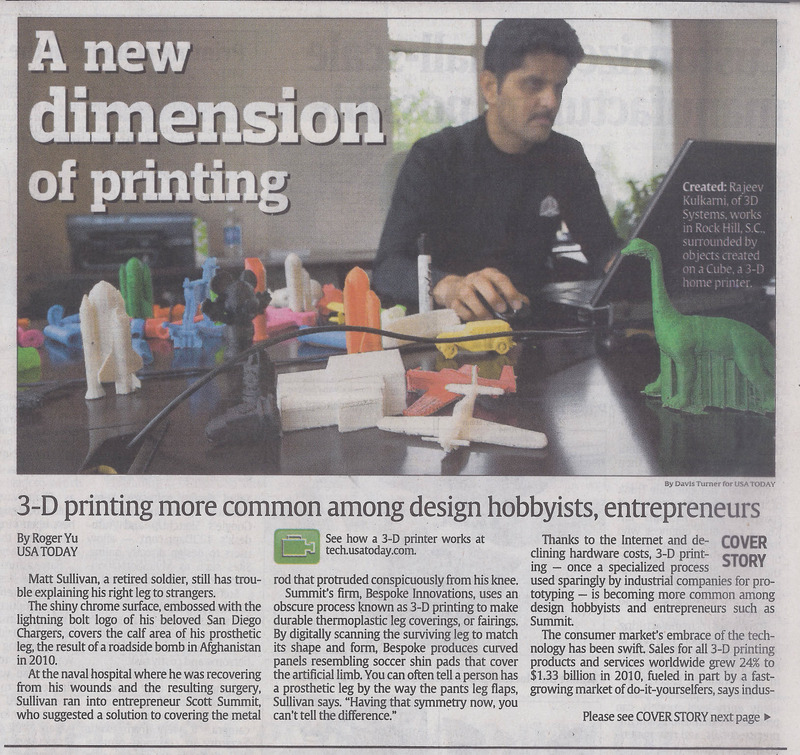 The article mentions a number of companies in the 3D printing world along with their products and services. For more than a decade I have been developing engineering software. I have come to the conclusion that it is quite easy to give people what they are asking for because almost always they know exactly what they want. They know exactly how it should work and you know exactly how to build it. Things get interesting when people don’t know that something exists and you need to start by figuring out how to explain it to them in the first place. Articles like these go a long way in helping solve this problem and spreading awareness.